has anyone uploaded the dvd5 to a site like media fire or rapidlibrary? i'd appreciate the links if so. method 2a didnt have audio when i played it. for what its worth i thought 3b was the best. but i still noticed the slow down. i watched v1 again and didnt notice it. what method was used there? 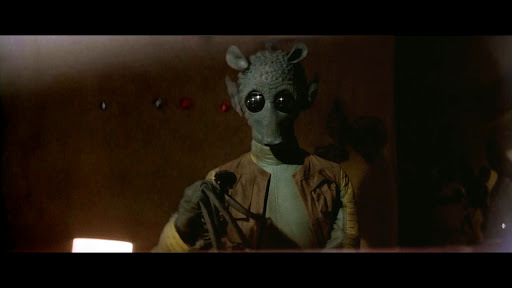 the greedo subs originally did sort of a morphing effect? Cool. Was that not present in the gout? I don't recall seeing it in that transfer. Was this on the 35mm print? huge improvement in my opinion. you can hardly notice the change any more. is it easy to just color correct a certain element in a frame? i heard you mention a while back that you were having trouble color correcting specific things in a frame because it would throw other elements colors off. PS maybe when you are done with the whole trilogy we can start a fund to fly harmy to America, rent a theater for a day, and have a star wars marathon screening his whole despecialized trilogy. I would donate in a heart beat. but just out of curiosity do you see a difference in color between these two images when looking at obi wans saber? if not i guess i'll just dust off v1 :-D. Hey at least it's not green. I just got done watching the second clip and it looks really good but around 0:22 to 0:24 i noticed bens saber changed colors back to the SE. Just thought i'd let you know if you feel like changing it. sorry if i am being super critical but the closer this gets to being perfect the more excited i get. would using v1.0s lightsabers be an option? i appreciate your hard work and i probably have no idea how much work that took but those changing sabers really stick out to me. The top left image is GOUT. As to the colours of the soldiers outfits, it is impossible to keep all the colours consistent, it is either the walls or the soldiers. In order to fix the soldiers, the walls have to get totally fucked up, in order to keep the walls pretty much consistent, the soldiers have to be fucked up just a little bit. It is unfortunately a necessary compromise. was this compromise necessary when you were using the hdtv footage? can you just color correct a portion of a shot? sorry i am inexperienced with video editing. awesome job as always harmy. will you be color correcting the despecialized footage to fit with the bluray footage? also if you are interested in some suggestions i noticed that the shot at around 2:27 has a lot of mosquito noise amongst the stars. just to be clear, the problem has to do with the new blu ray footage? so you could still release v2 using the hd broadcast as the source instead of the bluray? to be honest harmy, i would have no problem with you using the hdtv instead of the bluray. at one point i think you mentioned using the blu rays as a source in a new version but not redoing the despecialized scenes with the blu ray. is this true? awesome job on the credits. Even though there's no music i was humming it in my head. with that said I kinda hate to bring this up again but the stars still seem too bright to me. I guess I'm just use to the gout credits. If the stars are too bright they seem to mix in with the texts brightness, where as in the gout they are dimmer and seem like part of the background rather than foreground. were the stars originally that bright? that seems odd to me...however i didn't see it originally in theaters. great job laserschwert. It will be awesome to see in action starting with the wipe, music and all. I thought Mike's were a recreation. Anyway, for me, credits are so seriously unimportant a part of the film, that I would never put so much work into re-creating them. If someone makes them and at least two other people are willing to proof read them, I'd be willing to use them of course. But as I said, I'll be using DJ's Blu for v1.2, which is devoid of some of the artefacts present in Mattman's version, which I used in v1.0, so they should be better. I agree with you 100% on this Harmy, some here are getting way, way to damn nitpicky now, but like you said, they can make them themselves, I think some here forget what it is we are working with, and what we actually have at our disposal. I've gotten the impression from the posts i've read that you have a high quality scan of the original version of star wars. Is this correct? will you be releasing a workprint of v2? by the way good luck in school. when the leia hologram first appears after luke says "were you on a star cruiser or..." she looked a little too blue. by the way is the hologram color corrected or rotoscoped gout? take all the time you need. no matter what the release date is it's going to be better than lucas's which is probably the 12th of NEVER. I think one major hurdle is the cost but to be economical you could just scan in the parts that were specialized. people seem to forget that we already have about 80% of the original unaltered trilogy in HD. Yes and no. It still has the crushed blacks. A fresh 35mm scan could avoid that.